Poetry set to music, the mystical, thought out works of Eric Mingus are soulful and smooth, realizing moments of African, American, and world music. 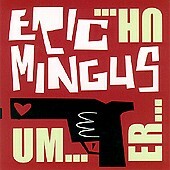 Described best as Afro-Cuban-American soul-funk-rock, Eric Mingus' Um... Er... is a transcending album that will take you a higher place with its smooth as silk language and heartfelt, thinking man's words. Poetry set to music may not be the best way to describe it, but it's the only way I can put this sound to words. Listen to it and maybe you can do better. I'll give it an A-.